In June 1527 Babar, founder of the Mughal dynasty, sent a unique gift to Shah Hasan, a close friend from Sindh. It was an exquisite set of Mughal Ganjifa round playing cards, each hand-painted on ivory and inlaid with precious stones. Little did he know that he was going to spark off an entire continent’s passion for playing cards! By the sixteenth century, Ganjifa cards became one of the most popular forms of entertainment for royals and commoners alike. As Ganjifa Cards gained popularity in the 16th century, the inevitable occurred. They somehow developed a distinctly Hindu flavour. Dashavatar Ganjifa cards with each suit depicting each of the ten incarnations of Vishnu, became the rage. Brahmins began to believe that playing with these cards washed away one’s sins. If nothing else, it was a great way of reciting the names of Gods! So, it came to pass that Ganjifa Cards imparted sacred hues to a profane activity like card playing. Today, these echoes are but a fading memory. Painted in the homes of a handful of artists and played by a dying breed of aficionados, Ganjifa Cards are in grave danger of being lost in oblivion. The only hope of survival for this amazing game is for people to start playing it again, and let history and mythology come to life once more. 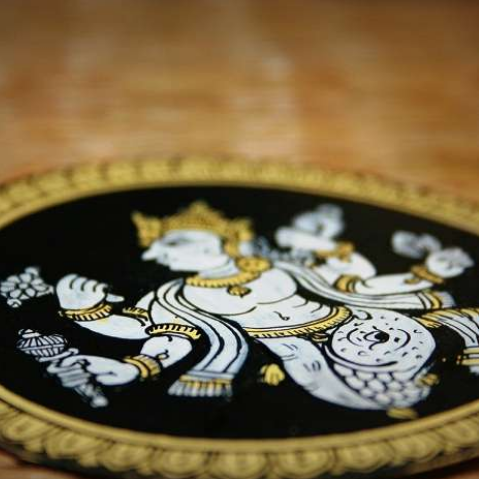 One of the earliest sacred myths that Ganjifa embraced was of the ten incarnations of Lord Vishnu. It is believed that in the history of human civilization, Lord Vishnu has incarnated nine times on earth so far to eradicate evil, restore Dharma (the force of good) and liberate the worthy from the eternal cycle of birth and death. Called the Dashavtara Ganjifa (in Sanskrit ,daśa means ‘ten’ and avtāra means ‘descent’) the game comprises ten suits of twelve cards, each of which represent one animal or human incarnation of Vishnu. Every suit has a Raja (King), Mantri (minister) and 10 numeral cards. statecraft. He represents the time in human evolution when countries were being formed and wars fought. The ninth incarnation of Vishnu is Buddha, representing the stage in evolution when man is capable of spiritual thinking and enlightenment. The last incarnation of Vishnu, Kalki, is yet to manifest itself. When it does, it will portend the end of mankind. Ganjifa Cards are a labour of love. They are painstakingly crafted upon a canvas that is made from old saris, painted using colours pounded out of stones and leaves and then finished with layers of natural gum. It is no wonder then, that each set of cards takes as many as 30 days to make. that are soft and starch-free. These are soaked in a solution of crushed tamarind seeds and water for four to five days, which is then sun-dried . A layer of similarly processed cloth is placed on top. 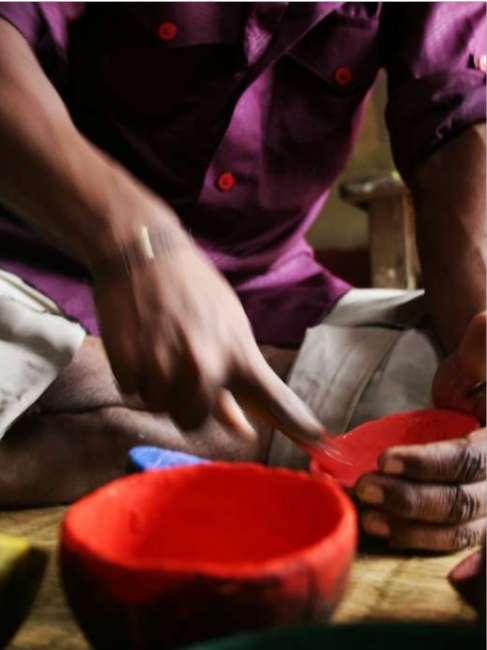 After the layered cloth is dry, a paste of chalk powder, tamarind and gum is applied on both sides. This dries into a tough, hard base. Artisans buff this into a smooth canvas using locally available stones. Now, one week into its production, the canvas becomes ready for painting. Traditionally, Ganjifa Cards were painted with mouse-hair brushes and natural colours like White (from powdered conch shells); Green (from various leaves); Black (from lamp soot); Red (from a stone called Hingulal); Blue (from a stone called Khandneela) and Yellow (from a stone called Hartal). First, the canvas is hand-cut into a perfect circle. An intricate border is painted around its edge. The artist then says a prayer to Vishnu and outlines his figure first with pencil and then with thin white brushstrokes. Then he paints on the clothes and ornaments. Secondary motifs are then outlined in black. Last, the whites of the eyes are highlighted. Interestingly, Ganjifa artists always paint freehand, beginning and ending with the colour white. Ganjifa painting is a craft struggling on the brink of survival. A revival of interest in these exquisite cards could bring about a change in their fortunes, while a further drop in interest could cause them to be lost in the foggy annals of history. Although Ganjifa Cards grace London’s Victoria and Albert Museum, Germany’s Deutsches Spielkarten Museum in Leinfelden and Austria’s Museum for Volkerkunde in Vienna, in order to bring alive the age-old magic of the game, people have to start playing with them once more. Posted in Art, Artist, Crafts, History, Homes, Revival, Sarees and tagged art, Cards, Craft, Ganjifa, Handmade, History, Mughals, Painting, Revival. Bookmark the permalink.